​28 tracks: Bu chaoin leam bhith ’n Uibhist (Hugh Matheson) * An cuala sibh mar dh’èirich dhòmhs’ (Miss Bella MacPhail) * Guma slàn don ribhinn òig (Ewen Morrison) * Cailleach Mhòr Stadhlaigh (Fred Macaulay) * Tha bò dhubh agam (Mrs Marion Ann MacDonald) * Mo bhò dhubh mhòr (Roderick MacDonald) * Hud, a bhodaich (Roderick MacDonald) * ’Ghruagach dhonn a’ bhrollaich bhàin (Donald MacLean) * Òran an ròin (Rev William Matheson) * Òran an ròin (Miss Margaret MacLeod) * Òran na caillich (Andrew Laing) * Hóro, leannain, an cluinn thu (Roderick Macaulay) * Tunnag bhàn Mòire / An ràcan a bh’ agamsa (Ewen MacDonald) * An Eala Bhàn (Mrs Helen Morrison) * ’S ann mu thuath, fada tuath (Ewen Morrison) * ’S ann a-raoir a rinn mi ’n dàn seo (Hugh Matheson) * Tha mìle long air Cuan Èirinn (Mrs Marion Ann MacDonald) * Gur mis’ tha fo mhì-ghean (Donald MacLellan) * Hó, mo leannan, hé, mo leannan (Miss Bella MacPhail) * Bodaich odhar Hoghaigearraidh (Rev William Matheson) * Canntaireachd (Miss Kate MacCormick) * Òigh Loch nam Madadh (Donald MacLean) * A fhleasgaich òig as ceanalta (Mrs Helen Morrison) * O, gur e mo ghaol a’ lasgain (Roderick MacDonald) * Horó, chan eil cadal orm (Ronald John MacDonald) * Òran an radain (Mrs Rachel MacLeod) * Hì ho ró, mo ghruagach dhonn (Donald MacLean) * Thug mi ’n oidhche raoir san àirigh (Donald MacLean) * Chì mi Clèatrabhal bhuam (Angus MacDonald) * Bàs an Fhìrein (Mrs Rachel MacLeod) * A Mhàiri bhòidheach (Ronald John MacDonald). 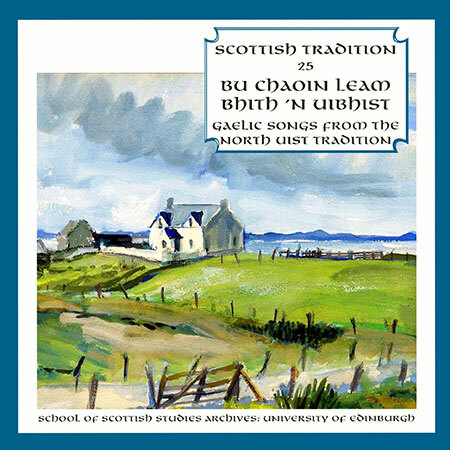 This album is the 25th in the Scottish Tradition Series of recordings from The School of Scottish Studies at the University of Edinburgh. The School and Greentrax are delighted to present this collection which, in common with previous volumes, is from the very important School Archives. The series was described in the past as “the most important series of traditional recordings ever”. The singers are Hugh Matheson, Miss Bella MacPhail, Ewen Morrison, Fred Macaulay, Miss Marion Ann MacDonald, Roderick MacDonald, Donald MacLean, Rev William Matheson, Miss Margaret MacLeod, Andrew Laing, Roderick Macaulay, Ewen MacDonald, Mrs Helen Morrison, Donald MacLellan, Miss Katie McCormick, Mrs Rachel MacLeod, Angus MacDonald and Ronald John MacDonald. The front cover - Archie’s House, Claddagh Kirkibost, North Uist - is reproduced by the kind permission of the artist Katharine Barr and the owner Donald John MacVicar.